We studied long-term daily records of rainfall and streamflow of the Incomati River basin in southern Africa. We used statistical analysis and the Indicators of Hydrologic Alteration tool to describe the spatial and temporal variability flow regime. We found significant declining trends in October flows, and low flow indicators; however, no significant trend was found in rainfall. Land use and flow regulation are larger drivers of temporal changes in streamflow than climatic forces in the basin. This paper simulates river basin water markets under two licensing regimes: fixed volumetric allowances and scalable licensing with dynamic environmental minimum flow requirements. The model is applied to the Great Ouse River basin in eastern England, with each water user from four main sectors represented individually. The results suggest that the scalable licensing system is more effective in protecting environmental flows, at the opportunity cost of 10-15% of economic benefits to water users. How does bias correction of regional climate model precipitation affect modelled runoff? This paper assesses four bias correction methods applied to RCM-simulated precipitation, and their follow-on impact on modelled runoff. The differences between the methods are small, mainly due to the substantial corrections required and inconsistent errors over time. The methods cannot overcome limitations of the RCM in simulating precipitation sequence, which affects runoff generation. Furthermore, bias correction can introduce additional uncertainty to change signals in modelled runoff. Previously we have shown that many earth-system and other variables can be viewed as samples from scale mixtures of truncated fractional Brownian motion or fractional Gaussian noise. Here we study statistical scaling of extreme absolute increments associated with such samples. As a real example we analyze neutron porosities from deep boreholes in diverse depositional units. Phenomena we uncover are relevant to the analysis of fluid flow and solute transport in complex hydrogeologic environments. A hydrologic model H08 is calibrated and validated on the Ganges-Brahmaputra-Meghna basin by addressing model parameter-related uncertainty. The impacts of climate change on runoff, evapotranspiration, net radiation and soil moisture are assessed by using five CMIP5 GCMs. The paper reveals the higher possibility of flood occurrence in the Meghna Basin due to the highest increase in runoff. Findings provide indispensable basis for scientifically based decision-making in climate change adaptation. Is the occurrence of floods changing in frequency or magnitude? We have analyzed 100 years of observed time series from 69 gauging sites and high-resolution modeling of climate change impact across Sweden for 140 years. The results indicate no significant trend in high flows in the past but some shifts in flood-generating processes at present and in the future. Rain-generated floods may have a more marked effect, and some specific rivers may be more affected by climate change than others. The paper models the socio-hydrologic system in a developing city -- Chennai, India -- using "counterfactual trajectories" to understand what might have happened if different decisions had been made 50 years ago. A key contribution is the inclusion of two-way feedbacks between the human, engineered, and hydrological systems. Households are allowed to adapt to decisions made by the water utility. This influences how they use water and consequently how much water is available in the aquifer. 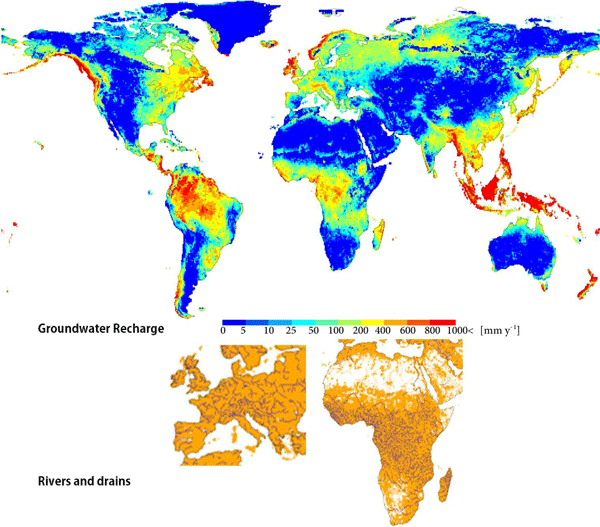 In this paper we present a high-resolution global-scale groundwater model of an upper aquifer. An equilibrium water table at its natural state is constructed. Aquifer parameterization is based on available global datasets on lithology and conductivity combined with estimated aquifer thickness. The results showed groundwater levels are well simulated for many regions of the world. Simulated flow paths showed the relevance of including lateral groundwater flows in global scale hydrological models. The paper presents an uncertainty analysis of the InVEST annual water yield model applied to the Cape Fear catchment, North Carolina. The InVEST model is a popular tool used in ecosystem services assessment based on the Budyko theory. The theory is used in a spatially explicit way, at the resolution of GIS rasters. 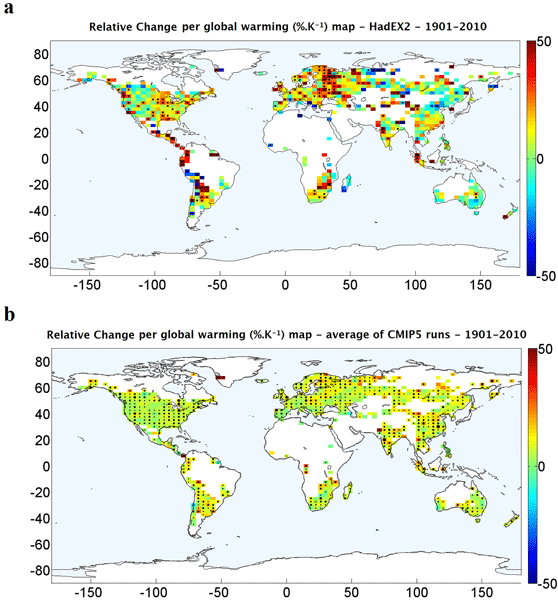 The study confirms the large uncertainties associated with the climate inputs and provides insights into the use of the spatially explicit model. This study shows that multisite calibration approaches for a distributed hydrologic model far exceed a calibration based on only the basin outlet. It also reveals advantages of semi-distributed over (non-parsimonious) fully distributed parameter schematization, by means of improved predictive capacity and reduced parameter uncertainty. The uncertainty in future streamflow resulting from variations in projected climate between GCMs substantially outweighs the calibration uncertainty. Projected shifts towards more dominant autumn/winter events during a future climate correspond to an increasing relevance of rainfall as a flood generating process in six Norwegian catchments. The relative role of hydrological model parameter uncertainty, compared to other uncertainty sources from our applied ensemble, is highest in those catchments showing the largest shifts in flood seasonality which indicates a lack in parameter robustness under non-stationary hydroclimatological conditions. Freshwater lenses are vulnerable to many climate change stressors that act over varying spatial and temporal scales. This study evaluates the spatial and temporal response of a freshwater lens to short- and long-acting climate stressors using a numerical modeling approach. The results identify critical factors affecting the freshwater lens response for a typical small, low-lying island setting, as well as the effectiveness of remedial options in improving lens recovery. The article reports on measurements, analysis and results of a Norwegian field study aimed to adjust automatic precipitation measurements for under-catch during windy conditions. An unique data set could be collected, documenting the under-catch of snow at very high wind speeds for the first time. A new continuous adjustment function for precipitation measured by an automated gauge covering all three precipitation types (snow, mixed and rain) was established. In agricultural management, a good timing in operations is essential to enhance economical and environmental performance. To improve such timing, predictive software is of particular interest. The objective of this study is to assess the accuracy of a physically based model with high efficiency. Compared to a more complex software (TEC) under bare soil conditions, a coupled model shows mostly improved efficiency and balance and a good capacity to predict water content thresholds. We used the past century’s time series of observed climate, containing non-stationary signals of atmospheric oscillations, global warming, and global dimming/brightening, to quantify possible systematic errors that may be introduced in estimates of potential evaporation and in hydrological modeling studies due to straightforward application of i) the common two-step approach for potential evaporation specifically, and ii) fixed instead of time-variant model parameters in general. A simplified conceptual socio-hydrological model based on logistic growth curves is developed for the Tarim River basin in western China and is used to illustrate the explanatory power of a co-evolutionary model. The socio-hydrological system is composed of four sub-systems, i.e., the hydrological, ecological, economic, and social sub-systems. The hydrological equation focusing on water balance is coupled to the evolutionary equations of the other three sub-systems. This paper examines modern and historical groundwater recharge rates to determine the impacts of reforestation in south-eastern Australia. This study shows that over both the long and short term, groundwater recharge in the study area occurs predominantly in the lower catchment areas. The results of this study show that spatial variations in recharge are important considerations for locating tree plantations, especially when looking to conserve water for downstream users in low rainfall regions.